Experience skiing expeditions in the midnight sun to the Geographical North Pole. These are the very rewarding tours for those who can accept camping in tents and appreciate wilderness. In April the climate is at its best with temperatures ranging from -30oC to -20oC. With an aircraft we will bring you from Spitsbergen to the Ice Camp situated at the latitude approx. 89 grad. North. Well-trained skiers will walk to the Pole with skis and pulks pushing through the pressure ridges, crossing the frozen leads and experience the feelings of the real Arctic explorers. The starting point for them will be chosen in accordance with weather and ice condition to guarantee the arrival to the North Pole on the appointed day. For ski fans, who prefer to spend a night in a warm place we suggest ski tours in the vicinity of the Ice Camp during the day and rest at night in the heated tents of the Ice Camp. They also have a great chance to witness a rich activity of the camp, share the camp with world-class skydivers, scuba divers or Arctic explorers. They will fly to the Pole with a helicopter. On the Pole all parties will have a celebration and contemplate the exploits of those who succeeded or failed to reach the place on the Earth where all meridians unite. From the Pole a helicopter and a plane will bring the travelers back to the civilized world. Arrival to Longyearbyen, Spitsbergen. Meeting at the Longyearbyen airport and transfer to your independently booked hotel in Longyerbyen. Free time in the city. 19:00 - Meeting with guide, check-out your individual and group gear, general instruction. Introductory dinner. Information meeting, where our staff will brief you on the situation at the Barneo region, planned departure time and answer your questions. Packing the expedition sledges. Overnight at hotel. Transfer to the airport for the flight to Barneo Ice Camp by our AN-74 (approximate flight time 2 hours 30 minutes each segment). Arrival to Barneo, which is about 89 degrees north latitude.Lunch in Barneo mess-tent. Pitching the expedition camp at Barneo site. Overnight at the expedition tents (1 tent accommodates 2 persons). OOn the arrival at the top of the globe we will celebrate it, and you can make a short phone call to your friends or relatives via satellite phone. We will spend a few hours nearby the Pole before helicopter takes us back to Barneo Ice Camp. Dinner in the Barneo mess-tent. Flight to Longyerbyen on AN-74 (approximate flight time 2 hours 30 minutes aech segment). On arrival to Longyerbyen the transfer to the designated hotels (if needed). The North Pole Certificate ceremony. Time and place are to be discussed with expedition participants and announced in advance. Night at the hotel. Ski expedition to the North Pole - is a complex mission that demands a good physical and psychological preparation. It is always better to enjoy the trek than to suffer of it. In order to estimate your abilities and prepare yourself better, you ought to know what to expect. You are going to walk on skis or afoot (depending on the ice conditions) for 8-10 hours daily for 6-8 days. 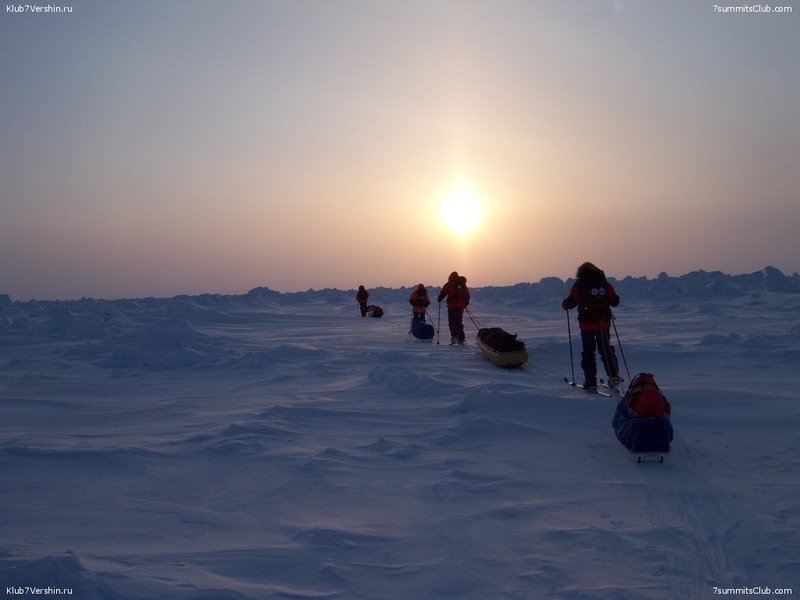 Besides, you have to pull 30-40 kg expedition sledge with equipment, fuel, and food. The ice surface is mostly rugged, making smooth and comfortable sliding pretty unlikely. Consult your doctor before making up a decision about expedition to the North Pole. Previous experience of the tours, ascents, expeditions and winter camping could prove very useful. Doing various winter sports would be very helpful. Changes and amendments may apply to the programme, depending on the weather, ice or other conditions. It is important to consider possible delays or alterations, and take them with patience. We strongly recommend you to acquire insurance against full or partial cancellation of the expedition. Important: Each expedition to the North Pole is the ultimate adventure full of random factors. Though we are making all possible efforts to accomplish every expedition, 7 Summits Club reserves the rights to change or cancel an itinerary due to weather and / or ice conditions, group fitness, political situation, strikes, wars, revolutions, terrorism and / or other factors beyond its control. Such changes are to be made in our customers’ interests and with regards to their safety. Personal medical kit: medicine, you normally take, along with aspirin, plaster, bandage, etc. Personal hygienic kit incl. toilet paper, toothbrush, etc.